TNB Night Owl – Happy Anniversary! HomeFeatureTNB Night Owl (Open thread)TNB Night Owl – Happy Anniversary! For the one-year anniversary of the site we needed something celebratory. Ideally, for the Owl, it should also incorporate some of the recurring topics… for example, science, the military, history, libations, music, and odd products. In consideration of all of that, we bring you the man credited with creating the Jell-o Shot, Tom Lehrer. It is worth noting, for accuracy, that food historians (yes, there are such people) have identified a handful of gelatin/alcohol mixtures which occurred prior to Lehrer’s 1955 invention, but none of them seem to have had the effect of Lehrer’s concoction. 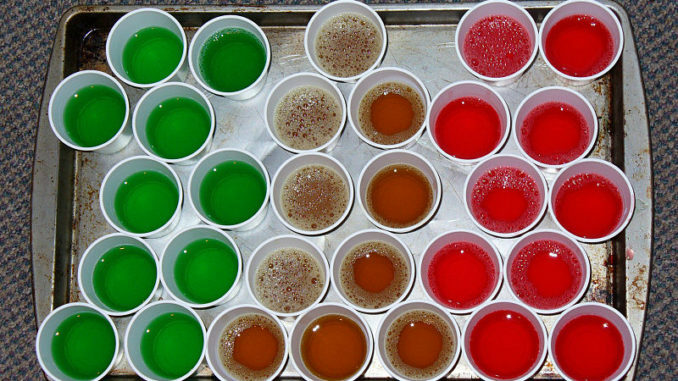 Between the people who enjoyed them at the party and others hearing about it from Lehrer’s interviews and lectures after he grew famous, the current popularity of the Jell-o shot seems to stem directly from the attempt by Army people to get alcohol onto a Naval base. So, next time you have a Jell-o shot, give a little toast to the 91 year old, still lecturing Tom Lehrer. But not tonight, if you have to get to work in the morning. Feel free to raise a glass to the first year of TNB, but it should probably be something more along the line of milk or 7-Up. If you’re really expecting to be awake for a while, though… here’s one of his full albums, starting with his famed “Poisoning Pigeons in the Park”. Question of the night: What’s your favorite dessert to make at home (with or without alcoholic components)?